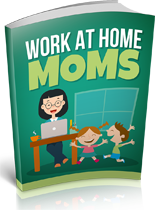 It doesn’t matter whether you’re fed up with working outside the home or you’re just ready to make some extra money, the opportunities available for work-athome mothers can prove incredible. If you’re holding back out of fear that your skills aren’t honed enough to turn dreams into reality, relax! Even women who lack degrees or high-priced “career skills” will find there are plenty of options for launching lucrative home-based businesses. It’s also possible to land actual on-staff jobs working for others out of a home office. Telecommuting is becoming more common than you might realize. You might even be able to sign on as a contract worker or freelancer with companies all over the world. The truth is you don’t necessarily have to have a specific skill set in place to work at home. There are workarounds to overcome almost any stumbling blocks that may stand in your way. There is no reason to get discouraged! Diving into the prospect of working at home can be an incredible decision to make for you and your entire family. It does, however, require careful consideration. Working at home can be a wonderful experience, but it’s just not for everyone. In this book part 1, we’ll discuss the things you’ll need to consider to have a successful go at it. There are some ways to tell if working at home really suits your style and some benefits and pitfalls that are smart to explore before moving full steam ahead to start an at-home career.